1. Do you need a special license to drive a Holly Bluff Houseboat? A. Renter must be a responsible adult 25 years of age or older with a valid driver license. Boat operators born on or after January 1, 1988, must present a Florida Boating Safety Education Identification Card or Certificate in order to operate our boats. The BoatUS Foundation’s Online Course is the only FREE Online Boating Safety Course approved by the Florida Fish and Wildlife Conservation Commission. 2. Do you have to be an experienced boater to drive a houseboat? A. No. Our trained crew members provide a thorough Houseboat Orientation and Captain’s Lesson. 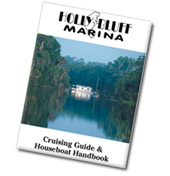 We recommend reading our Cruising Guide & Houseboat Handbook for more information in advance of arrival. Each renter is given a hard copy of this handbook upon check-in. 3. Are navigational maps provided? A. Our Houseboat Handbook includes river maps with channel markers that highlight points of interest, other marinas and attractions. The handbook also offers suggested anchorage and/or tie-up locations, as well as areas to avoid. During the orientation our crew member will give more specific recommendations based on your interests or intended destination. Holly Bluff Marina allows our boats to travel from our marina up to 20 miles south to the Lake Monroe Bridge and 30 miles north to Silver Glen Springs. We do not allow our boats to travel at night. .
A. Our houseboats are very fuel efficient. The Volvo Penta engines use approximately 1 gallon per running hour at normal cruising speed. The generator uses about 1 1/2 gallons per running hour. The average fuel use for a weekend is about 75 gallons. 5. Which springs can we get to by houseboat? A. Blue Spring State Park is approximately 6 miles south of our marina. You can beach the houseboat in a designated area on the river and walk up to the spring. Silver Glen Springs is 30 miles (about 5 hours) north of Holly Bluff and is the most popular destination on the St. Johns River. You can drive the houseboat into the spring run and stay overnight in this spring. The water at both springs is crystal clear and 72º degrees year around. If you tow a small boat you can get to DeLeon Springs, Salt Springs, and Alexander Springs. These three springs are NOT accessible by houseboat. Learn more about our springs and other points of interest. 6. Can we pull auxiliary watercraft such as a ski boat or fishing boat behind the houseboat? A. Yes, you may tow a boat up to 20′ long. We suggest towing your boat behind the houseboat and will provide specific instructions on how to do this when you arrive. You will need to bring a long tow rope, not a ski rope. 7. Do you have a launching ramp? A. Yes, we have a launching ramp which is free of charge for our houseboat rental customers. We have ample room for truck/trailer parking. 8. Can we rent a small boat to pull behind the houseboat? A. Moonlighting Boat Rentals rents small fishing boats and kayaks. You can call them direct at 386-738-2788 to reserve and they will have the small boat here when you arrive. Our marina crew can assist you with placement of the kayaks onto the back deck of your houseboat and/or assist with getting the tow line ready for the small boat. Payment is due upon arrival. 9. How many anchors are on board the houseboat? A. Two Danforth style anchors. One for the bow, one for the stern. 10. Can we pick up the houseboat after hours? A. We are open from 8:30 a.m. – 5 p.m. seven days a week. If you arrive after 5 p.m. the office will be closed. Please call us if you plan to arrive late so we can leave a note on the door directing you to your houseboat. To begin your cruise on the day of your charter you must arrive by 4 p.m. If you arrive late you are welcome to stay aboard the houseboat and we will check you in and give you the orientation the next morning. Houseboats are not allowed to leave the dock until the renter has completed the orientation. Houseboats are not allowed to travel at night. 11. Do life jackets come with the houseboat? A. Yes, all houseboats are equipped with Coast Guard approved life jackets and a flotation device. Although we do have life jackets for small children, if you have small children you may want to bring your own life jacket for their comfort. 12. Is the houseboat equipped with a sewage holding tank? A. Yes, each houseboat is equipped with a large sewage holding tank. We have our own sewage treatment plant at Holly Bluff and two pump-out stations that are located on our fuel dock. The holding tank is pumped out before and after each rental. 13. What form of payment is acceptable for the rental? A. We accept Visa, MasterCard, American Express, travelers checks or cash. We will accept a personal check if it arrives two weeks prior to your departure. 14. Do you allow pets on your houseboats? A. We allow dogs for a charge of $15 per day. Each dog must weigh less than 35 pounds. If you bring your dog we suggest that you purchase a few pieces of sod prior to arrival that you can place in a box on the back deck for bathroom facilities. It can be challenging to find a suitable place to take the dog ashore due to excessive vegetation along the river banks. Always keep an eye on your pets as there are alligators in almost every body of water in Florida. 15. What are your hours of operation? A. Holly Bluff Marina is open from 8:30 a.m. until 5 p.m. seven days a week. We are closed Thanksgiving Day and Christmas Day. 16. Can we get in touch with you after hours? A. No, if you are experiencing a maintenance problem you need to call us prior to 5 p.m. We only do service calls during business hours of operation. It is important not to anchor in the main river channel since there is commercial traffic on the St. John’s River. You must get to the side of the river if you are having problems. Most boaters on the river are very friendly and you can hail someone if you are having problems and cannot reach us by phone or marine radio. Additional information and instruction on after-hours challenges will be addressed upon check-in. 17. What do we do if the generator stops running after hours? A. Consult your HouseboatHandbook and push the reset button as shown to you by your instructor. If this does not work you can go to a nearby marina and plug in to power. However, if it is after dark, remember your boat is equipped with battery operated lights and the water, toilet and gas char broiler will work without electricity. Anchor in a safe place and call us at 8:30 in the morning. We do not allow our houseboats to travel after dark. 18. Are your houseboats equipped with a marine radio? A. Yes, we monitor channel 12. Marine radios are good for a range of about 15 miles. If you are out of range and your cell phone does not have service then you can call the marina nearest to you and they will call us on a land line with a message from you. 19. Will our cell phone work on the river? A. Yes, in most places. Sometimes you have to go on the top deck for better communication. If you require internet access during your trip you should contact your cell phone provider for hotspot plan options. 20. What items do you supply on the houseboat? 21. What items should we bring? 22. Do you have a coin laundry? A. Yes, we have a 24-hour coin laundry facility onsite. The cost to wash and dry one load is $3.00. 23. Can we buy groceries on the river? A. No, plan accordingly and gather your provisions in advance of arrival. There are several grocery stores in the area including Publix, Winn-Dixie and Wal-Mart. Our marina store has ice, soft drinks, ice cream and snacks. 24. Do you sell live bait for fishing? A. No, we have a few fishing supplies but no live bait. There are tackle shops with live bait nearby, the closest one being Hontoon Landing Marina. 25. Do you rent fishing equipment? A. Yes. We rent fishing poles and tackle boxes. We do not have live bait. 26. Do you sell fishing licenses? A. No. Please visit http://www.myfwc.com or call 888-347-4356 to purchase a fishing license via credit card. 27. Are there restaurants nearby? A. There are several restaurants on the river that you can reach by boat and we will show you these during the orientation. 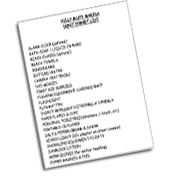 Most of these have limited slip availability for large boats and it is advisable to call them in advance to see if they can accommodate your boat. 28. Is it safe to swim in the St. Johns River? A. Like any other body of water in Florida, there are likely to be alligators and other reptiles in the area. Swim at your own risk. People do swim and ski in the river and surrounding lakes during daytime hours, though we recommend visiting a spring where the water is clear and cool. 29. Can alligators get onto the houseboat? A. We have never heard of an alligator getting on a houseboat. It is against the law to disturb or feed alligators. If you feed them they will come very close to the boat looking for food, and this puts you and the animal at risk of harm. DO NOT FEED ALLIGATORS. 30. Do we have to come back to the marina every night? A. No. For the ultimate river experience, you should stay out on your houseboat. Anchor behind an island or in one of the lakes, or find a nice clearing off the channel and tie up to a tree so you don’t have to be concerned about the anchor slipping. During your Orientation our marina crew will recommend good spots to overnight. 31. Are the mosquitos bad out on the river? A. For most of the year mosquitos are not a problem, especially during daytime hours. However, we recommend that you bring insect repellent. We do sell repellent and citronella candles in our marina store. During certain times of year when the temperature and barometric pressure reach a certain level the lakes in particular have a “blind mosquito” that comes out at sunset and they can cover the sides of the boat. They do not bite and are just a terrible nuisance. We suggest that you do not go into the lakes when these mosquitos are in the area. They are usually not a problem on the river. 32. Do you have security at the marina? A. We have video surveillance covering most areas of the property. We are a small privately owned marina. The owners live on the premises and keep a close watch on things. We also have several people who live aboard houseboats here at the marina. We are located in a rural area of finer homes on the river and seldom have a problem with theft. 33. How far can we travel on the St. John’s River? A. Holly Bluff Marina allows our houseboats to travel from our marina 20 miles south to the Lake Monroe Bridge and 30 miles north to Silver Glen Springs. With surrounding lakes and adjoining rivers there are plenty of areas to explore. 34. What is there to do on the river? A. Fishing, swimming and snorkeling in the springs, kayaking or canoeing, gator watching, bird watching, sun bathing and just relaxing. The only music you will find outside the boat comes from nature. The owls and frogs will sing you to sleep at night. There are no nightclubs on the river. But you will see beautiful wildflowers, moss draped cypress and oak trees, osprey, eagles, egrets, blue and white heron, and turtles. Florida is blessed with beautiful blue sky by day and lots of stars at night. 35. Will we see Manatee? A. Blue Springs State Park is located about 6 miles south of the marina. This park is a winter sanctuary for manatee. It is very common to see manatee on the St. Johns river October through March. After the weather warms up most manatee go to the intracoastal waterway. However, some manatee stay here year around so it is not unusual to see them all year. Many who stay have been recently released from an accident or injury, or they have a newborn so they stay for the summer to teach the baby survival skills. ALWAYS WATCH FOR MANATEE! PLEASE OBSERVE ALL NO WAKE AND SLOW SPEED ZONES! 36. Are there pirates on the river? A. No. The river is very safe. We have never had a customer boarded by a pirate and do not recall anything ever taken from a rental houseboat while out on the river.